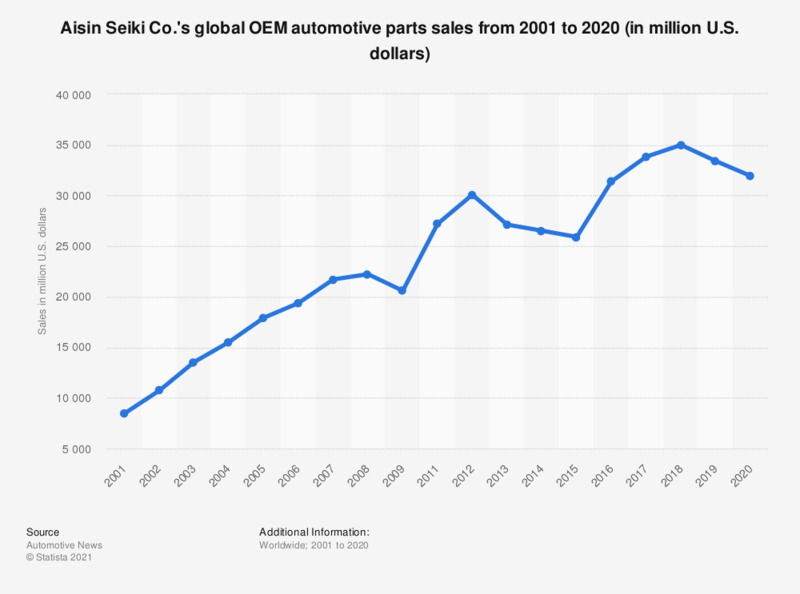 The statistic represents Aisin Seiki Co.'s global automotive parts sales from 2001 through 2017. In 2017, the Japan-based automotive supplier produced global sales of approximately 34.1 billion U.S. dollars. The abbreviationn OEM stands for original equipment manufacturer. The figures for 2010 through 2015 are taken from previous editions of the Automotive News publication (http://www.autonews.com/assets/XLS/CA110872620.XLS); the figures through 2009 are taken from "On the Road 2011", published by the U.S. Department of Commerce in 2009. The 2016 and 2017 figures were converted from a rate of 1 EUR = 1.1979 USD (as of December 31, 2017).